“In recent years, police departments have widely adopted military tactics, military equipment (armored personnel carriers, flash-bang grenades) — and, sometimes, the mindset of military conquerors rather than domestic peacekeepers,” writes TimesDispatch.com. President Obama famously said, during the gun control debate of 2012, that, “AK-47s belong in the hands of soldiers, not on the streets of America.” Yet it is his administration that’s putting weapons of war on the streets of America via local police departments. 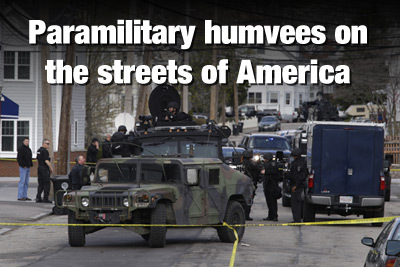 By arming police and training police in the hardware and tactics of military warfare, the Obama administrations is doing an end-run around Posse Comitatus and effectively putting wartime troops on the streets of America. As part of all this, federal law enforcement have been training with so-called “no hesitation targets” that train them to instinctively shoot pregnant women, children, young moms and old men. These targets — whose existence was first denied, and then downplayed when the denials didn’t work — offer irrefutable proof that the corrupt, criminal government currently running the USA is actively planning to engage women, children and senior citizens with weapons of war. The IRS is now being trained with AR-15 rifles, and DHS has also purchased thousands of armored assault vehicles that are mine resistant and bulletproof. 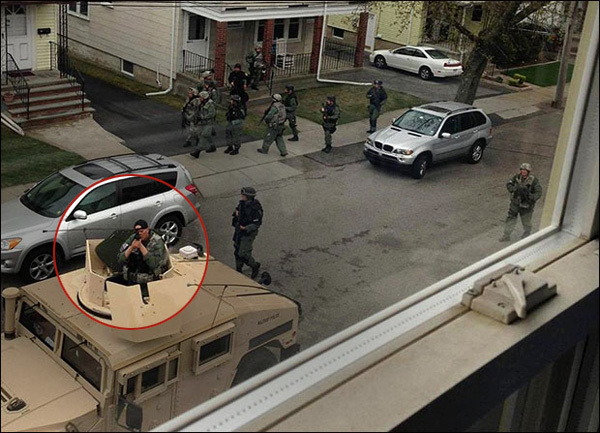 Meanwhile, the Boston marathon bombing proved that local police will now act completely outside of law and initiate Martial Law in a manhunt for a teenager. It wasn’t declared Martial Law, of course… it was called “shelter in place,” meaning you could not leave your homes. 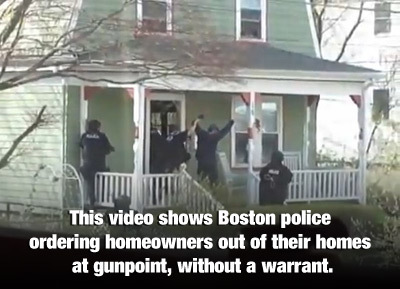 Once the lockdown was in place, Boston police went door to door, yanking citizens out of their homes at gunpoint, screaming at them to put their hands up or be shot on sight. This was all done completely without any warrant or any suspicion of wrongdoing on the part of homeowners. The scenario had been carefully planned: A terrorist group prepared to hurt vast numbers of people around Boston would leave backpacks filled with explosives at Faneuil Hall, the Seaport District, and in other towns, spreading waves of panic and fear. Detectives would have to catch the culprits. … But two months before the training exercise was to take place, the city was hit with a real terrorist attack executed in a frighteningly similar fashion. So here’s the question: At what point will Americans realize their country has become a Stasi-inspired police state tyranny? When will they march on their state capitols and demand to be treated with dignity and respect rather than being beaten, shot, arrested, intimidated and censored by police? And I ask this question as a supporter of local law enforcement. I’ve worked with police, trained with police and volunteered with police. I know that most police officers across the country are honorable men and women who are trying their best to keep the peace. But the number of “good” police seems to be shrinking while the number of “rogue” cops is on the rise. 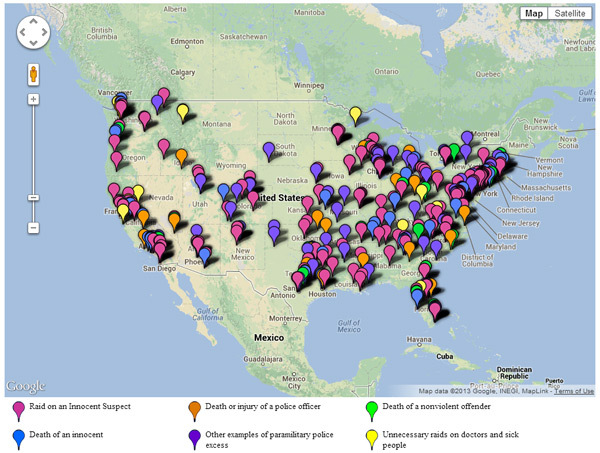 This highly disturbing trend is an intentional one put in place by the Obama administration that’s trying to militarize police all across the nation in a run-up to something very, very big: an event that is expected to cause nationwide rioting and social unrest. Why else would DHS buy 2+ billion rounds of ammunition, bulletproof roadside checkpoint booths, armored assault vehicles and full-auto assault rifles? Why else would police be trained to shoot pregnant women, children and senior citizens on sight? Why else would the government be spying on every phone call, email and text of every U.S. citizen right now? We are living under a nightmare Big Brother police state right now, and it’s not an accident. This has all been brought in for a specific purpose: to first acclimate the public to a police state presence (hence the TSA security pat-downs), and then to activate that police infrastructure to engage in the mass-arrest or mass-murder of Americans. This will happen as long as Americans allow it to happen. Every day that the American people spend distracted by gay marriage, sports celebrities, TV programs and the Kardashians is another day that the criminal elite running this country build up their infrastructure of terror and oppression against the People. While Americans are hypnotized into a state of delusional denial by CNN and the New York Times, the Obama administration is strangling freedom to death with a determined rollout of total surveillance, actual death squads that target journalists, the criminalization of whistleblowing, the targeting of reporters in the mainstream media, the intimidation of patriot groups by the IRS and a hundred other forms of oppression, intimidation and blackmail. What we are witnessing here is a government gone completely criminal. This is a government that now openly kidnapped the President of Bolivia on the off chance that his airplane might have been carrying Ed Snowden. This is the government that openly admits to the existence of secret kill lists that target American citizens for assassination. This is the government that runs the world’s largest surveillance spy program which even spies on ally nations like Germany and France. The U.S. government abides by no law and respects no limits whatsoever to its power. It is a rogue, out-of-control criminal mafia that has taken over positions of government in order to grant itself the appearance of authority. It is this mafia mentality that’s trickling down to local police departments in the form of aggressive tactical training, armored assault vehicles and even police uniforms which now look like something torn right out of a dystopian, Orwellian sci-fi flick depicting a dark future. I coined the term “Trickle-Down Tyranny” in 2011. The phrase was later picked up by Michael Savage and became the title of his book by the same name. Since 2011, Savage himself has become increasingly outspoken about the rise of tyrannical government, the oppression of freedom in America, and the dangerous tactics of intimidation and oppression being practiced by police nationwide. 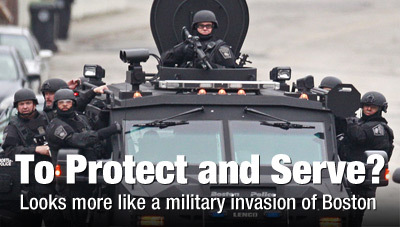 Everyone can see what’s happening: America is turning into an occupied police state. Individual freedoms are bring crushed. All the rights guaranteed under the Bill of Rights are being systematically destroyed by design. The Obama administration is rapidly becoming the Orwellian dictator we all feared might one day rise up in America, yet half of America remains too far gone to open their eyes and realize what’s happening. And so the injustices are allowed to accelerate to the point where innocent Americans are being routinely terrorized by law enforcement. 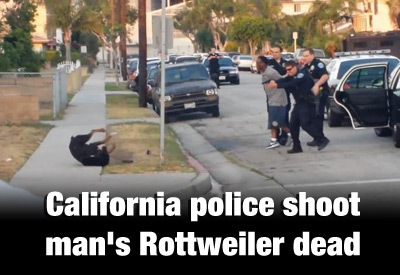 While the guilty run free, the innocent are targeted for shakedowns, arrest or beatings. This is the death of freedom in America. You are watching the destruction of the Land of the Free and the rise of Obama’s tyrannical regime. If you and millions of others do not rise up against this, you may one day find yourself collapsed on your knees, looking over a large ditch of fresh bodies while a “police officer” holds a pistol to the back of your head and pulls the trigger. You, like hundreds of millions before you, are about to become another statistical victim of government gone bad. Throughout history, rogue governments have murdered at least 260 million people. And it all began with precisely the same process we are seeing unfold in America today. Rise up or be exterminated.